The euphoria that engulfed the country one year ago when Prime Minister Abiy Ahmed assumed the hot seat at Arat kilo seems to be receding slowly. Another round of protests is visiting the country and they are erupting here and there. In fact, protests are even happening in places that have been relatively peaceful during the three years of protests which resulted in the ongoing reform led by the PM and his team. 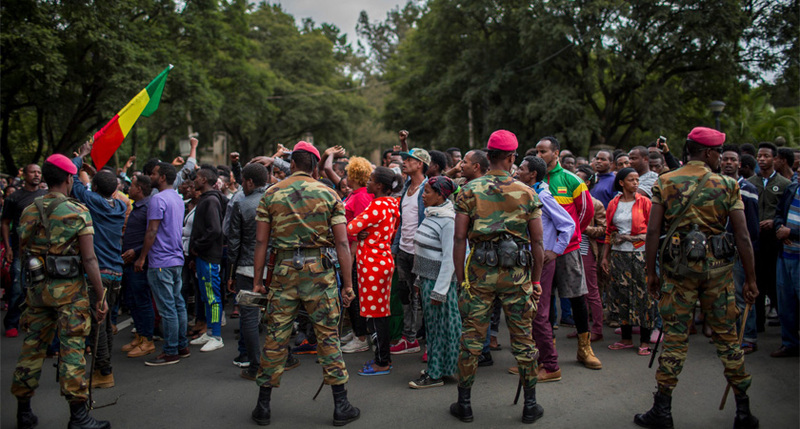 New protests resulted in the death of many people, the displacement of others and the deployment of the military force to manage the security crisis in the area they are happening. Coupled with a wide range of challenges that the administration of Abiy Ahmed is facing, which includes economic and humanitarian predicaments in the country, have put the administration in a tight situation. The security challenges of the country seem to have continued, according to the World Threat Assessment of the US Intelligence Community, released in January 2019. And assessment asserts that the challenges emanating from the country’s internal political matters. Although the immediate cause of these conflicts in the country might vary from place to place and from people to people, ethnic politics seemed to be at the center of all of it. And, it appears this much has been admitted by the government. Ethnic-based politics is at the center of the federation and the ruling party, the Ethiopian Peoples’ Revolutionary Democratic Front. Hence, the statement from the security advisor made many speculate that the basic makeup of the current federalism and politics in the country is coming to an end. On the other hand, there are more than 107 political parties in the country which signed a code of conduct with the National Electoral Board of Ethiopia and the majority of them are ethnic-based political parties. “Saying that it is a national security threat does not necessarily mean that the basis for Ethiopian federalism should be changed; those sorts of decisions (political decisions) would require further discussion,” Temesgen clarified his statement. “The democratic culture in our country is based on a culture of a winner and a loser; we are not open to accepting differences. The principal cause for this is because our democracy is directly copied from the western world and it did not tend to include our national values–Ethiopians are consensus-seekers and we reconcile disputes by bringing both parties to a middle and common ground without blaming any of them,” he critiques. For him, Ethiopia’s security threat emanates from the inside and it is what the country could not bypass. Despite the country’s history of preserving its identity and sovereignty without any technological input centuries ago, it has reached a time of cruel barbarism. And, unless the country addresses its internal affairs, it won’t be able to tackle external threats which are created because of weak internal situations. And while doing this, Ethiopia has to make a change in continuity and should not start from scratch like the previous times, he advises. Dr. Merera Gudina, a renowned politician and a scholar, agrees that there are problems with the ethnic politics which entered Ethiopian politics some 50 years ago. Merera observes that the current challenge with ethnic politics in the country is triggered by the elite and they have to be both accountable for damages so far and responsible for solutions in the future.